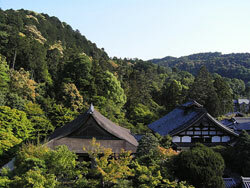 Nanzen-ji (Southern Mountain Temple) is considered the most famous and important Zen temple in the world. Home of the Rinzai sect of Zen Buddhism the temple consists of 12 sub-temples, which only a few are open to the public. Also within the temple grounds are several gardens, of which only three are available to be viewed. Two of the sub-temples also serve vegetarian lunches. The history of the Nanzen-ji begins in the year 1290 when the emperor Kameyama invited Fumon the priest to his retirement palace (he abdicated in 1274 due to a poor relationship with the Kamakura shogunate) to exorcise a ghost that was plaguing the palace with problems. Instead of chanting incantations to drive out the malignant spirit, like any other priest, Fumon simply sat down and meditated (zazen) until the ghost apparently left. The emperor was so impressed with the strength of Zen Meditation he graced Fumon with his lower palace on his retirement villa grounds. While the emperor lived in the Upper Palace, Fumon ran the lower palace as a Zen temple where he taught Zen. The emperor himself was a student - and even granted himself the title of Ho-o or Great Priest. In time Fumon asked the emperor to include the upper palace of the villa as part of the temple. The emperor readily agreed and the building of what is today known as the Nanzen-in was begun. This building was the start of the Nanzen-ji and today contains a statue of the emperor in priest's garb. The popularity of Zen caused a bit of tension with the Tendai sect Monks of Mount Hiei. The warrior monks raided Nanzenji in September 1393 and burned it to the ground. The temple suffered other devastations including a fire in 1447 and the temple was leveled again in 1467 during the Onin Wars. In 1597 Toyotomi Hideyoshi, in addition to rebuilding the temple, presented the temple with a new Butsu-den (Buddha Hall). Others also granted gifts of buildings and structures to the temple, including Tokugawa Ieyasu and Emperor Go-Yozei. In addition to its gifts of buildings Nanzen-ji also was granted land, being as it was in the good graces of the Tokugawa Shogunate. During the period from 1616 to 1868 the temple containing 62 sub-temples on 114,819 tsubo (roughly 378,902 square meters). This power and prosperity ended during the Meiji period (1868-1910) when the role of Buddhism was downplayed in favor of the more nationalistic Shinto religion. The temple's grounds were drastically reduced, leaving only 9 sub-temples and 33,966 tsubo or 112,087 square meters. As you walk towards the main entrance of the temple you will see a two story gate called the San-mon (Mountain Gate) by some and Tenkanoryu-mon (Dragon Gate) by others. This gate is one of the three largest gates in Japan, though as one may expect it is not the original. Originally built in 1296, it was destroyed in 1447. It was not rebuilt until 1626 when Todo Takatora, a general of Tokugawa Ieyasu, rebuilt the gate as a memorial to the soldiers who died at the Battle of Osaka Castle in 1616. Walking through the gate you will notice many stickers on the walls. These have been placed by followers who wish to be noticed by the gods. It is believed the higher your sticker is the easier it is for the gods to see it, therefore you are more likely to be noticed by them. To aid those who are vertically challenged, or for those who feel they need to be noticed by the gods there is an expandable stick that can be used to place your sticker. Go on to the upper floor of the gate and you will not only be able to see a fine view of the city on the outside platform of the gate, but you will also see a room which holds images of Buddha, Ieyasu, Todo Takatora, 16 holy men, and 2 bodhisattvas. Look above above your head and take notice of the incredible painting of young women and phoenixes. This amazing work of art was created by Kano Tanyu and Tosa Tokuetsu. This room has also been made famous in literature due to a famous Kabuki drama. The story is of Ishikawa Goemon, a man who unfortuanately killed during his first theft, making him an outlaw. As he ran from the authorities he hid in the San-mon. Upon being caught in 1585 he and his son were sentenced to be boiled in oil. As the punishment was being carried out he held his child above him until he collapsed into the boiling oil. The Hojo (Abbots' Quarters) here is divided into a larger (Daihojo) and smaller (Shohojo). The Daihojo is used as the entrance to the quarters and was given to the temple as a gift from Tokugawa Ieyasu. Originally a gift to the emperor by Toyotomi Hideyoshi, Ieyasu did everything in his power to ensure that Hideyoshi would be forgotten. Commissioning a new palace for the emperor in 1611 he gave this building to Nanzen-ji, explaining why the roof is made of cypress, not the traditional Buddhist tile. Walk into the entrance and pay your fee for viewing both the Daihojo and Shohojo, then leisurely amble about looking at the painted fusuma created by the Kano school that once were housed in the imperial palace. As interesting as the Daihojo may be, it is the Shohojo that is of interest to most people for its screens (fusuma) decorated in Chinese landscapes as well as noted paintings of tigers and the kuresansui (dry garden) outside. Believed to be created by Kobori Enshu (1594-1634) it is this garden, known as the Tiger and Cubs Zen Garden, that attracts people to Nanzen-ji. Like most Zen gardens it is not only important what is present in the garden, but what is not in the garden as well. Within the garden are three small rocks (the tigers) accompanied by three smaller rocks (the cubs) all surrounded by pure white sand (a stream). While some feel the shrubs within the garden distract the viewer from their meditative thoughts (Ryoan-ji is another dry garden with no "distractions) others view the space between the rocks and shrubs as the most important part of the garden. Here they find the inner world and perhaps the "emptiness" of enlightenment. Within the garden is a small teahouse that is unfortunately not opened to the public. The teahouse is also believed have been designed and built by Kobori Enshu. Of the few sub-temples that are open to the people at large, the oldest is the Nanzen-in, which was presented as a gift from the emperor Kameyama. Though destroyed in the Onin Wars, the very religious mother of Shogun Tsunayoshi had it rebuilt in 1703. Within the main hall of this sub-temple are a portion of the remains of Emperor Kameyama and the statue of him in his priestly dress. The garden here is reported to have been created by Muso Soseki (1275-1351), but because the garden has been changed so often if he did indeed design it, few if any of his original ideas can still be seen. The garden's pond contains several small islands, one even in the shape of the Kanji for heart (shin). The hill that houses the waterfall which feeds the pond also is home to the temple Bell Tower. Be sure to stop in at the Chosho-in, also called the Marishiten, at lunchtime. This sub-temple of the Nanzen-ji has been cooking vegetarian meals for over three hundred years, so they've had the time to get it right. The fresh tofu lunches served are simple but fantastic. The Tenjuan sub-temple, though open to the public, is only open in the spring and autunm. This sub-temple was founded in the late 14th century by Kokan Shiren in honor of Priest Fumon, the founder of Nanzen-ji. Much like the other buildings here this temple was leveled in the Onin Wars and was not rebuilt until 1602 by Hosokawa Yusai. The Hondo, Shoin and Main Gate of Tenjuan that were rebuilt in 1602 are all still standing today. Within the Hondo is a wooden statue of Fumon, a self portrait of Fumon, several painted fusumas with landscapes and the like, and portraits of Hosokawa and his wife. Tenjuan's garden is open for viewing and consists of a small waterfall, a two ponds, a waterfall and a white sand footpath. Also on the sub-temple's grounds is a small cemetary with Hosokawa Yusai and a few well known figures of the Meiji area. The Konchi-in sub-temple had a home in the northwest of Kyoto before coming to Nanzen-ji. In 1400 it was moved and became affiliated with Nanzen-ji. Not surprisingly it was damaged in the Onin Wars and was reconstructed in 1600 by Ishin Suden. A Chinese Gate and the Hondo of Konchi-in were brought by the Tokugawa shoguns to Nanzen-ji when they dismantled Fushimi Castle (Hideyoshi had built Fushimi castle to protect Kyoto's vulnerable southern flank - the Tokugawa's demolished the castle to prevent Kyoto from encouraging resistance to their power), but only the Hondo remains. After the fall of the Tokugawa Shogunate in 1868, the gate was removed by the new Meiji government to the Hokoku Shrine, ostensibly in honor of Toyotomi Hideyoshi. Many say this was actually a spiteful move to show the distain that the Meiji Government had for the favoritism previously shown to Nanzen-ji. The dry garden in front of Konchi-in's Hondo is once again thought to have been designed by Kobori Enshu. Strolling around the sub-temple will bring you to a pond containing an island and across from the pond a small Shinto Shrine. Follow the path around the pond and you will find yourself in facing a large gateway that leads to a path lined with lanterns and ending in a Shinto Torii. To get inside the wall you see follow it around until you come to a Kara-mon (Chinese Style Gate). This memorial building to Tokugawa Ieyasu was built by Ishin Suden in 1628 according to Ieyasu's will. In front of the yellow and vermilion colored Shinto building is a black lacquered Buddhist building, inside of which is an image of Ieyasu with 8 holy men figures on either side. Behind the main hall is a teahouse. Fukuji-cho, Nanzenji, Sakyo-ku, Kyoto City. Take the City bus and drop off at Hsshoji-cho bus stop.